HRH Prince Harry, First Lady Michelle Obama and Dr. Jill Biden visited the USO Warrior and Family Center at Fort Belvoir, Virginia, to witness first-hand the life-changing impact of the art and music therapy programs for wounded, ill and injured service members. I am in no doubt that my two deployments to Afghanistan changed the direction of my life,“ Harry said while at Fort Belvoir. "There is very little that can truly prepare you for the reality of war. The experiences can be stark and long lasting. Army National Guard Sergeant First Class Jon Meadows suffered a moderate traumatic brain injury in 2013 while serving in combat in Afghanistan. His injury affected his vision, cognition and fine motor skills. Melissa, his dedicated wife and caregiver, gave up her career as a nurse to tend to her husband and their four children. The family was forced to leave their home in Connecticut so Jon could receive medical treatments at Fort Belvoir, Va. Melissa’s strength and experience holding her own family together led her to create a caregivers’ support group at the USO Warrior and Family Center at Fort Belvoir. During regular meetings, caregivers share resources, participate in recreational activities and support one another through the recovery process. As leader of the group, Melissa coordinated activities and outreach to new caregivers, all while balancing her own role as caregiver for her husband. I wasn’t the same me and I couldn’t deal with it,” recalled Sergeant First Class Jon Meadows. “So when I came over here and Ashy and them got whatever I needed and I’d get in there and I’d just paint and all of that would just go away… Art saved my life. It really did. After moving, the Meadows visited the USO almost daily, adding that it has "literally been a home-away-from-home.” There was a sense of loss as Jon could not maintain his usual pace. Melissa searched for new activities that Jon could master. USO staff and volunteers encouraged Jon to participate in art programs, where many wounded troops find healing. Jon picked up a paint brush and began his journey into the world of art. Despite having no experience, Jon soon discovered an innate talent for painting and drawing; though it would be his sculpting skills, revealed at the Art League’s IMPart (Injured Military Personnel and Art) classes that would define him as an artist. When First Lady Michelle Obama, Dr. Jill Biden and Prince Harry visited the USO, they marveled at Jon’s work, particularly one of his first sculptures, “Transitions.” Mrs. Obama was so impressed that she commissioned a sculpture for The President. Today, Jon’s artwork has been displayed at local studios, and the family continues to visit the USO to take classes and encourage others. Jon and Melissa Meadows were awarded the Colonel John Gioia Patriot Award on April 19, 2016 at USO-Metro’s 34th Annual Awards Dinner. You can follow Jon’s journey on Instagram @a_soldiers_voice. 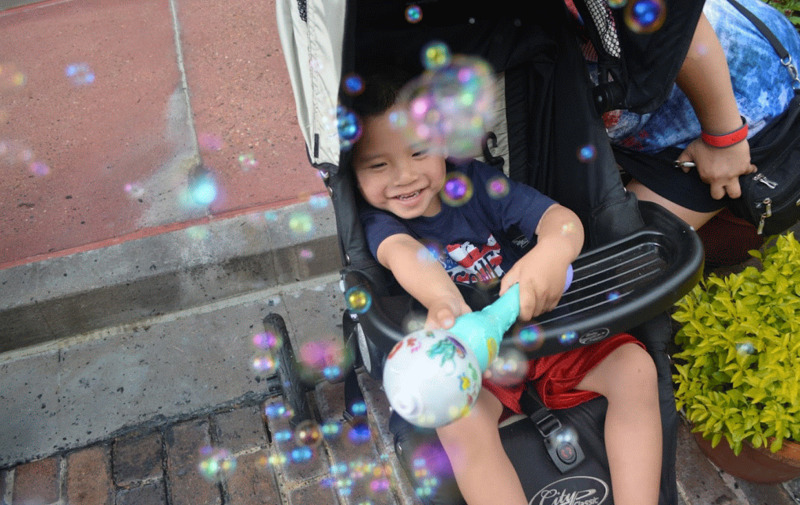 USO-Metro took 17 military families to the experience at the “happiest place on earth” at Walt Disney World in Fl. Representing every military branch of service, among each family was a service member or military spouse undergoing medical treatments for a serious illness. The families included 34 jubilant military children ranging in age from 7 months to 13-years-old. Our son has had a rough year as I’ve pretty much been on bed rest for the entire year,“ commented a military spouse who recently endured her last round of chemotherapy and is scheduled for three more surgeries, ”[this trip] meant so much to us because our son has been in the house and he has had a hard time making friends, so we’ve tried really hard to make his life as easy as possible but it’s hard. Recognizing the need for boosting the morale of non-combat wounded, ill and injured service members or their military spouses, USO-Metro suggested to American Airlines and the Gary Sinise Foundation taking military families undergoing medical treatment for potentially life-threatening illness to Walt Disney World. Discussions began in earnest in April 2016 and in less than six weeks the trip was organized and fully funded by generous sponsors. Named “Salute to the Troops, Orlando” the all-expense paid excursion is the newest in a series of partnerships with USO-Metro, American Airlines and the Gary Sinise Foundation. Other excursions include Salute to the Troops, Las Vegas and Hollywood. Additional sponsors for the Disney World trip included Envoy, which provided the chartered jet, the Airpower Foundation, the Non-Commissioned Officer Association (NCOA), and Walt Disney World Resorts. The Gary Sinise Foundation provided funding for the three-night-stay at Disney’s Beach Club Resort, while the Airpower Foundation and the Non-Commissioned Officer Association (NCOA) helped pay for meals, t-shirts and goodie bags.